The Good Soldier Schweik at Theatre Inconnu September 27-October 14 2017. A review. You are here: Home / Events / The Good Soldier Schweik at Theatre Inconnu September 26-October 14, 2017. A review. 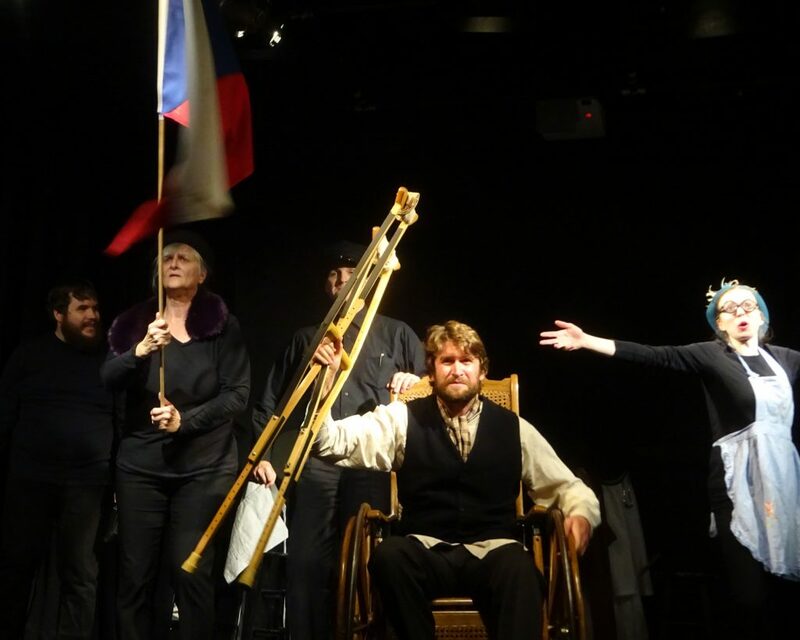 Theatre Inconnu brings the Czech anti-war novel The Good Soldier Schweik to the stage in an adaptation by Michael John Nimchuk that owes much to the epic theatre theories of Bertolt Brecht. Poor Schweik (Justin Muirhead) is a hapless dolt caught up in the hubris surrounding Archduke Ferdinand’s assassination. One moment he’s jazzing with his buddies at the local tavern and the next he comes under suspicion by the secret police for his all too realistic musings about the inevitability of war. One misfortune follows another on his way to the front—or does it? Throughout the play, there are reminders of the famous Chinese proverb Sai Weng Lost His Horse—an action’s result might appear fortuitous when it is calamitous, and vice-versa. Schweik bumbles along, his oft-repeated mantra “one must make the best of things”, exposing the cupidity and corruption of the ruling Hapsburg classes and the church, and their staggering bureaucracy. Characters are brushed with broad strokes; physical postures and gestures almost slapstick in their range, reactions often overblown. 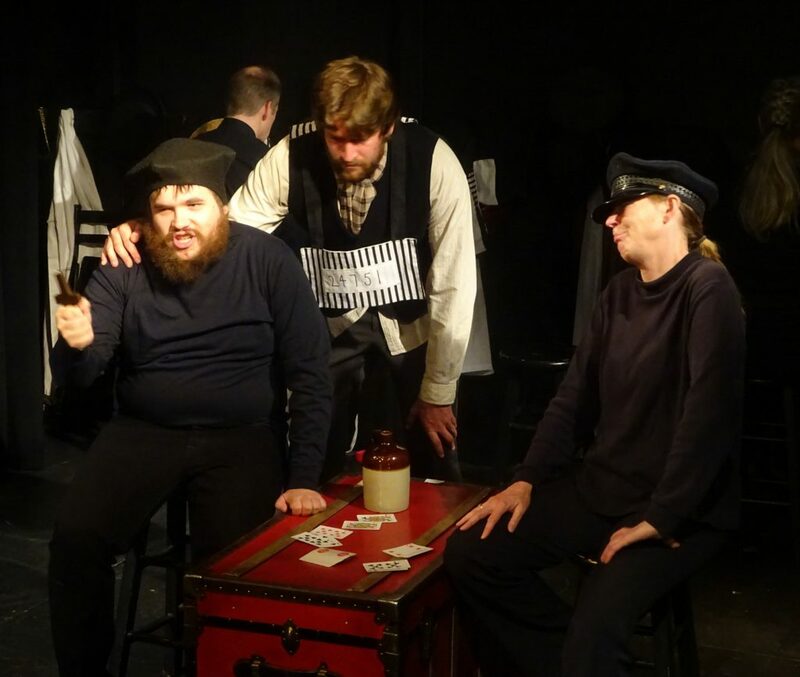 The ensemble takes on many roles—aided by a series of hats, scarves, coats and props (Pearl Arden—costumes; Maureen Colgan—props) to differentiate them to the audience. Julie Gray mugs it up as police inspector Bretschneider and is wearied to frustration with Schweik’s antics as Commander Lukáš. Ken Yvorchuk tries to keep the peace as the bar owner Palivec (to no avail—he still comes under suspicion) and is outstanding as the padre preaching peace while inciting violence—“squash the foe”—his southern accent speaking volumes. Kara Flanagan simpers and preens as Lukas’ love interest, Katya, and performs in Keystone Kop style, with obvious and exaggerated delight, as various military personnel. Anton Brakhage makes a fine drunk as military chaplain Katz and is particularly officious as Mr Wendler, Katya’s husband. Pati-Ann Lawe is wonderfully obtuse as various administrators and officials, in complete opposition to her role as the flirtatious Mrs Palivec, barmaid. In his first role for the stage, Muirhead embodies the bewilderment and insouciance of the title character—shrugging his way through situation after situation with a devil may care attitude. Director Don Keith does triple duty, directing as well as designing, not only the projections (scenes are played as episodes with title cards—another nod to Brecht), but also the very effective sound design, full of military marches, bold Slavic dances and music recalling silent movies of yore. The Good Soldier Schweik begins with a number comprised entirely of body percussives (choreographed by Sylvia Hosie). The overarching effect is reminiscent of Commedia dell ‘Arte and Punch and Judy shows. Throughout, Hasek’s politics are clear—he prods and incites, portraying everyone other than Schweik in the worst possible light. Fans of Catch 22 and MASH, as well as devotees of The Government Inspector, will appreciate the many satirical moments. The world sits on the brink with bumptious world leaders hurling insults at one another non-stop. One hundred years after this work was introduced, is history about to repeat itself? As subversive and thought-provoking as the day it was written, passing into the common vernacular in Czech where “to schweik” has become a verb, The Good Soldier Schweik is a horrific cautionary tale when seen from this vantage point. Cast (alphabetically): Anton Brakhage, Kara Flanagan, Julie Gray, Pati-Ann Lawe, Justin Muirhead, Ken Yvorchuk. Disclaimer: I was offered a complimentary ticket to The Good Soldier Schweik. The Children’s Republic by Hannah Moscovitch. Belfry Theatre September 12-October 8 2017. A review. Age of Arousal at Theatre Inconnu February 14-March 4, 2017. A review.